This was our first plane trip with Sally (she was only 2-months-old)! Normally, I don't think I would have taken her on a plane so young, but a friends' wedding forced us out of our Brooklyn (and small weekend trips) comfort zone and we decided to take Sally on her first true vacation. Of course I was anxious about what to pack (what does a baby need when they're that far away from home?! ), about the flight (what if she freaks out from ear pressure when landing?! ), and if she starts screaming during our friends' wedding. Turns out, it was all okay! It really IS true that what everyone says about traveling with babies at this age was true... 2-month-olds sleep A LOT, and if all else fails, you always have the magical power of breastfeeding to calm a little one down! The wedding was outside of Scottsdale, Arizona and the guests were stayed at the hip hotel, The Saguaro. The hotel had a lovely pool where Sally had her very first swim ever! I already lost my mind when I saw her in a bathing suit, but seeing how happy she was in the water made my heart pitter-patter. During the wedding part of our trip, we primarily did wedding hangs and poked around historic Scottsdale (which was right near the hotel). But my most FAVORITE activity that we did in Scottsdale was visit Frank Lloyd Wright's Taliesin West. Alan's cousin took us there, and I couldn't recommend the tour enough! This was Wright's winter home that he started building in 1937. The tour walks through all of the architectural details that he incorporated into the property and the reasoning behind them. It made me basically want to visit EVERY Frank Lloyd Wright house. Highly recommend it but make reservations for a tour in advance (it'd be a bummer to get there and not get all that good tour info!). After the wedding weekend, we hit the road! 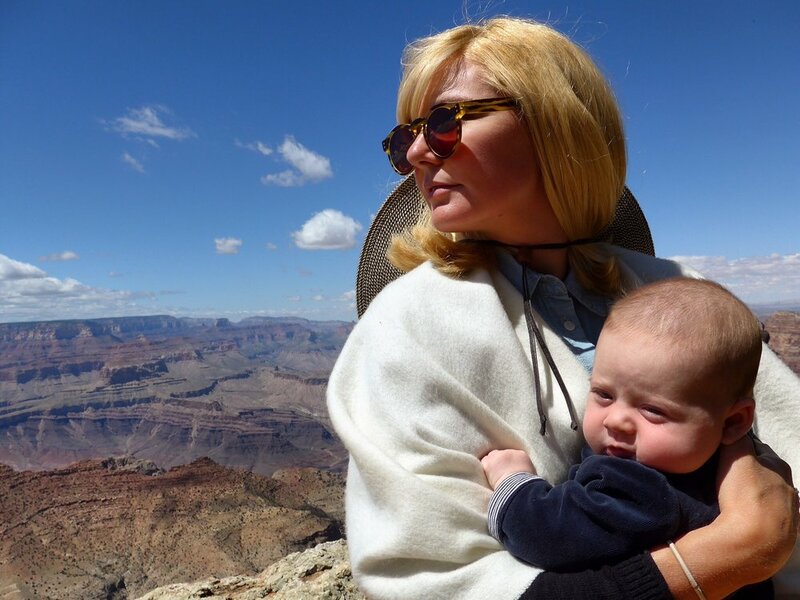 It was my first mother's day and I thought what better way to spend it than at the Grand Canyon! Unlike the flight, we had a long and trying drive there (turns out it takes a lot longer to drive long distances when you have a baby in the car that doesn't want to be strapped down for 5 hours), but we made it to the Grand Canyon before the sunset, which was my goal. When booking the trip, we were lucky enough to get a room at Yavapai Lodge, which is located within the park itself. QUICK TIP – we love staying at lodges inside national parks. They're usually fairly cheap and have great old-times vibes, plus you're in the park! But they book up quick so plan accordingly. The Yavapai Lodge has a mid-century feel, which added some charm, but mainly it was great because, like I said, there's the convenience factor of already being in the park. I only planned two half-days at the Grand Canyon, so we didn't do any impressive hikes. We mainly walked for a while along the south rim and took plenty of photos. We then got in the car and popped in and out of a few different view points. While next time I really want to get into that Canyon more, just looking at it from the various view points was incredibly impressive and truly takes your breath away. It is certainly the most magical place I've breastfed Sally (and changed her diaper)! It can be windy so be sure to bundle up! From the Grand Canyon we headed north towards the boarder of Utah to Antelope Canyon. This is a place that I had seen countless times on instagram and each time thought that I needed to get there one day. It can make even the worst photographer feel like they are on assignment for National Geographic. The curves and color in the sandstone are beautiful and the way the light pours in through the canyon is pure magic. The tour operators understand the desire of the visitors to take great photos so they give you tips on how to get the best photos in there and ensure that everyone has ample time to get the shot that they want. While in the area, we also took a boat ride (Sally's first boat ride) on Lake Powell. The scenery in that area is incredibly dramatic, especially for someone like me who has never been to the Southwest. We did not make the hike to Horseshoe Bend (sounded steep with Sally and we are lazy by nature), but from what I've seen in pictures, it seems like something worth looking into. 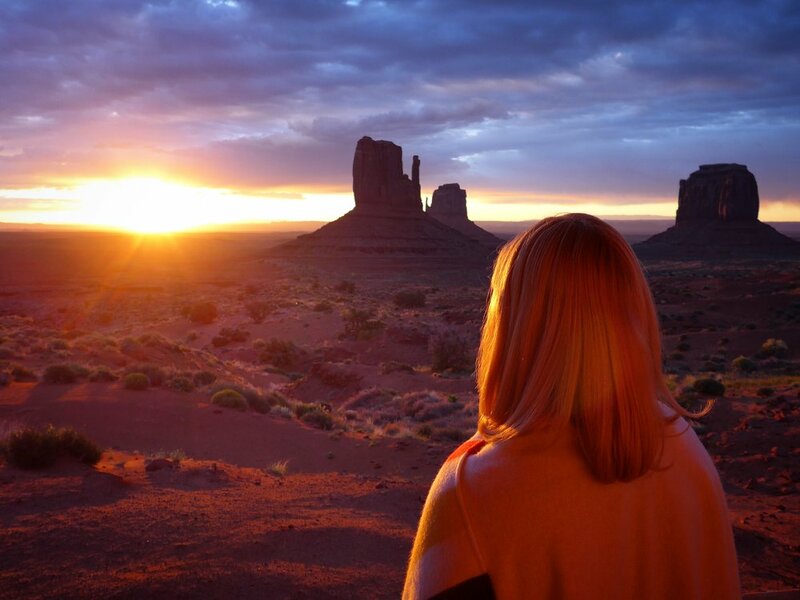 On to the last and most monumental part of our trip, Monument Valley (see what I did there?). You guys! This place is unreal. We decided to stay in the valley so we could wake up and look at those monuments that we came so far to see. There is a big, awesome hotel there, The View Hotel, which also offers some cabins, which is, of course, what we booked. They do have a campground there too that I'm sure offer some epic camping views if that's your jam. But the cabins were incredible with EPIC views of the sunrise right from your back porch! During the day, we got a map and did the short drive that takes you through all of the monuments. The area is vast and your jaw will definitely drop. I can't EVEN with this place! You just have to see it to soak it all in! A trip full of a lot of firsts for Sally and The Harrises. One for the books!